This amazing space wallpaper of the star formation region NGC 6334 is one of the first scientific images from the ArTeMiS instrument on APEX. This amazing space wallpaper of the star formation region NGC 6334 is one of the first scientific images from the ArTeMiS instrument on APEX. The picture shows the glow detected at a wavelength of 0.35 millimetres coming from dense clouds of interstellar dust grains. 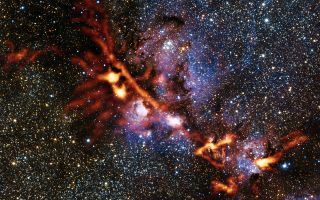 The new observations from ArTeMiS show up in orange and have been superimposed on a view of the same region taken in near-infrared light by ESO’s VISTA telescope at Paranal. This image was released Sept. 25, 2013.